Dr. Gibson earned her doctorate from Columbia University where her thesis examined the role of light in the novel. Virginia Woolf is one of her favorite writers. Photo: Emma Joyce. “What do I really love about a small college? I get to teach and write for lots of different genres,” explains Dr. Lindsay Gail Gibson as she sips a cup of tea in her office. Framed prints of Virginia Woolf book covers line the wall above her desk—Mrs. Dalloway, To the Lighthouse, A Room of One’s Own, and The Waves. Bright green plants neatly spaced on her window sill grow in various vessels—a ceramic brown pot, a clear plastic container, a glass jar. 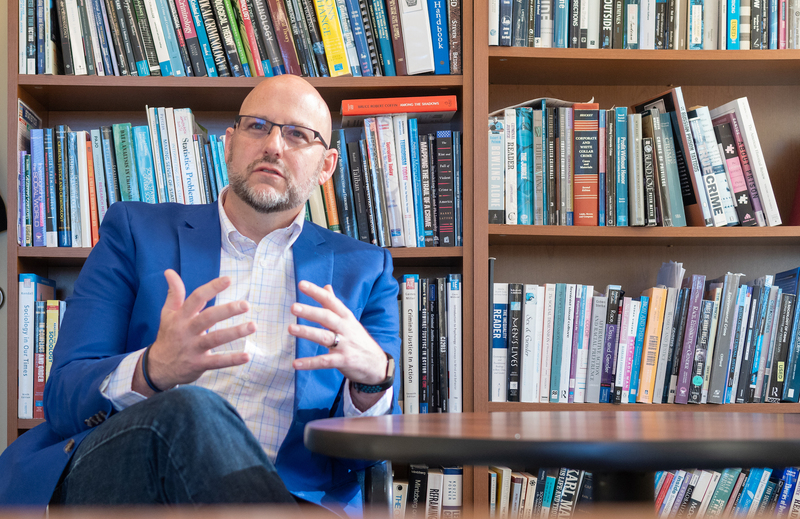 Dr. Gibson, who joined the College as an assistant professor of English in 2016, has assumed the role of director of the writing and publishing major, replacing retired long-time director Ed Rielly. While her specialty is the novel (English Classics and British Literature), she also teaches Nonfiction Prose. She writes poetry and pens reviews for contemporary fiction. “It’s important to be involved in different kinds of writing, different modes, for different audiences,” she says. She publishes for the scholarly community, for the general public, and for the tight-knit poetry press circuit. Dr. Gibson particularly enjoys narrative theory—examining how humans tell stories to make sense of their experiences and how the literary styles that authors employ to convey meaning to readers. For example, during the 19th century, lighting advanced from candles to gas to electricity, changing daily rhythms at workplaces and at homes. Dr. Gibson’s thesis at Columbia University explored how authors during this time period used obsolete forms of light to express character motivations, diving into the tension between daylight and artificial light. This erudite attention to literary devices can also be found in her reviews of contemporary fiction, which have garnered national exposure (such as “Helen DeWitt’s Philological Fictions,” in the Los Angeles Review of Books and “Inferred meaning: A clever campus novel filtered through linguistic bewilderment” in The Times Literary Supplement). Such detailed observation on a line-by-line basis requires thoughtful and measured attention. Before joining Saint Joseph’s, Dr. Gibson lived in New York City for seven years. While she admits that the Big Apple provided plentiful cultural and literary events to spark creativity, it also supplied distractions. Even a task as simple as walking down a street to purchase an item at a neighborhood store could derail her writing time, due to the city’s nonstop energy. In Maine, she enjoys the concentration that a slower pace of life affords. She can focus more intently on her work and she also has formed close, meaningful relationships with her colleagues and neighbors. In addition to her teaching responsibilities, Dr. Gibson serves as the faculty advisor for e.g., the College’s literary journal, and serves as an advisor for internships. When not grading papers or preparing for class discussions, you’ll find Dr. Gibson working on a book about Jonathan Franzen, who has been dubbed a “Great American Novelist.” Ironically, Franzen remains pessimistic about the novel’s role—viewing it as almost obsolete. Her manuscript is due next fall when it will, undoubtedly, make its way into the right hands.